The highly anticipated The Force Awakens, the seventh film in the Star Wars franchise, introduces its viewer two new lead characters. and a new era for the cult sci-fi hit. 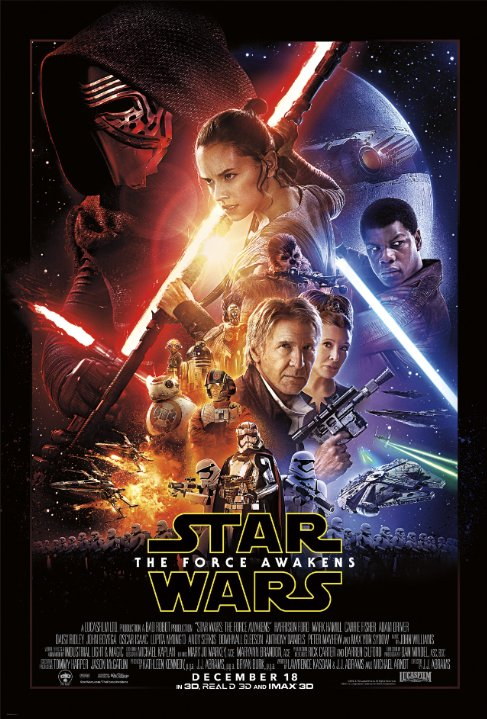 Set thirty years after the defeat of the Galatic Empire in Return of the Jedi, The Force Awakens follows Finn (John Boyega) and Rey (Daisy Ridley) as they join the Resistance and take on the newest threat to their universe. In a series dominated by its white male leads, Luke Skywalker (Mark Hamill) from Episodes IV to VI, and Anakin Skywalker (Jake Lloyd and Hayden Christensen) from Episodes I to III, The Force Awakens breaks with tradition by introducing the viewer to a new, diverse pair of leads. Finn, who is raised from infancy to become a Stormtrooper, makes the decision to rebel against the only life he has ever known when he comes face-to-face with the ruthless slaughter of innocent civilians that the job requires. When he first removes his iconic Stormtrooper helmet and the audience sees a humanness underneath the uniform, it shatters the illusion of the dark side as a predominantly seductive force. The Stormtrooper has no free will from birth, and is brainwashed into its actions; in this light, Finn’s decision to rebel appears even more radical, and the Stormtrooper is a more sympathetic character than in earlier films. The casting of Boyega in this role is also significant: as a British male with Nigerian heritage, he is in staunch contrast to the blonde, blue-eyed Luke Skywalker. Rey, on the other hand, has already been heralded as a feminist hero. Though a lowly scavenger, the adventure she sets out on with Finn, helping the Resistance find the missing Luke Skywalker before the evil First Order does, demonstrates her capability and intelligence. She speaks many languages, she’s masterful in combat, and is a quick thinker and adept pilot. There is no scene in which she succumbs to the role of damsel in distress,; instead, she’s usually the rescuer when Finn gets in a jam. Though Rey is young and amateurish, there are scenes in which certain male characters seem stunned and impressed by her power. Interestingly, Rey’s abilities are not questioned by female characters, such as Maz Kanata (Lupita Nyong’o) and Leia Organa (Carrie Fisher), as strong women generally aren’t surprised when other women are strong. It’s clear the feminist allusions are also deliberate. While feminism in The Force Awakens has been somewhat simplified to standard feminist tropes – such as the Bechdel Test – there is much more empowerment at work within the film. Leia Organa, formerly known as Princess Leia, is now leader of The Resistance, and is referred to in all but one instance as “General” rather than “Princess,” taking on a title that is earned, rather than given to her. Perhaps the most feminist element of The Force Awakens is the lack of sacrifices made for its strong female characters. In the original trilogy, Leia was by no means a passive character, but that sometimes came at a price. For instance, she killed her captor, Jabba the Hutt, in Return of the Jedi, but the price for this was her role earlier in the film as one of Jabba’s bikini slave-girls, a filmic decision that figured her has as object of lust for many teenage boys. There were many gender imbalances in the original Star Wars trilogy; in contrast, The Force Awakens rarely requires its strong female characters to pay a narrative price. There are perhaps a few questionable moments with minor characters, but for the most part, The Force Awakens sets out to embrace its female fans and to carve out a place for women in its universe. Though the differences in The Force Awakens should not deter earlier fans from the new film. They will be reunited with old fan favourites, such as the swashbuckling Han Solo (Harrison Ford) and his partner, Chewbacca (Peter Mayhew). Nor does The Force Awakens embrace the new tradition of film franchises, in which sequels or remakes are transformed into something darker and grittier than the original stories. There are certainly dark moments in the film, but it refuses to sacrifice its humour for the sake of creating an illusion of depth or realness. The Force Awakens fluidly moves through comedy and drama; sometimes rapidly, but always with precision. In this way, it appeals to its fans by retaining the flavour of the original series, while also appealing to a broad scope of newcomers—those who like the lightness of film, and those who like the dark. But for me, what drew me into The Force Awakens (and in fact, most science fiction) are the creators’ imaginings. I wanted to see aliens in all their strangeness, from the beautiful to the grotesque. And I wanted to see grand-scale explosions in a wide variety of environmental settings. The Force Awakens has all of this—it is for any glutton of the unreal. While the CGI is incredibly detailed, it also remains fantastical, using the technology available to create the sense of awe that has characterised the Star Wars franchise since A New Hope. If you are a feminist intrigued by the Star Wars franchise, then The Force Awakens is probably the best place to start. The film manages to maintain its old enchantment, while also recognising an audience that is more wonderfully diverse than the original films could ever have expected. This entry was posted in Film and tagged film, film review, star wars. Bookmark the permalink.